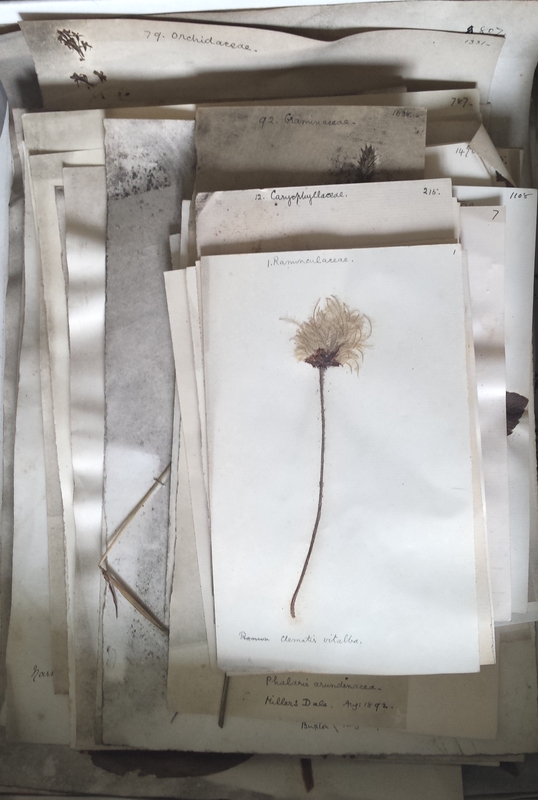 My ears pricked up when I heard there was an Herbarium in the Museum’s collection stores, and I was off to investigate at the first opportunity. 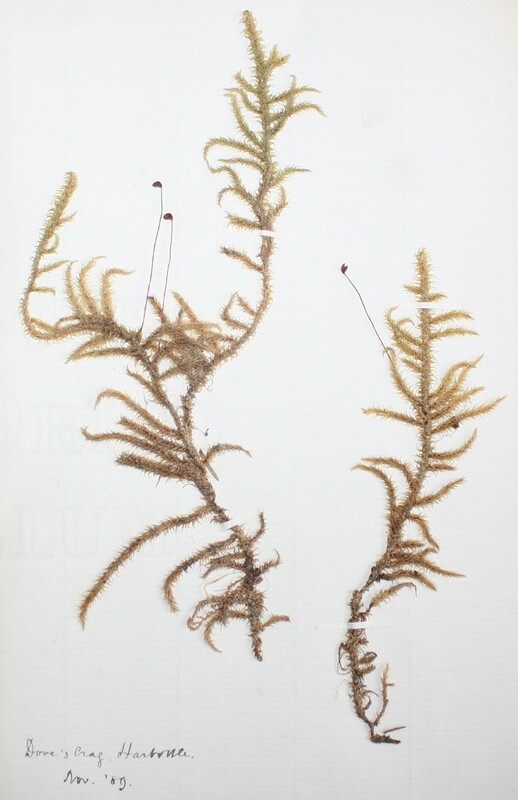 The Herbarium is a collection of 97 sheets of plant specimens. It gives a wonderful snapshot of the flora of the time, as well as a fascinating insight into the collector’s life and the times she lived in. 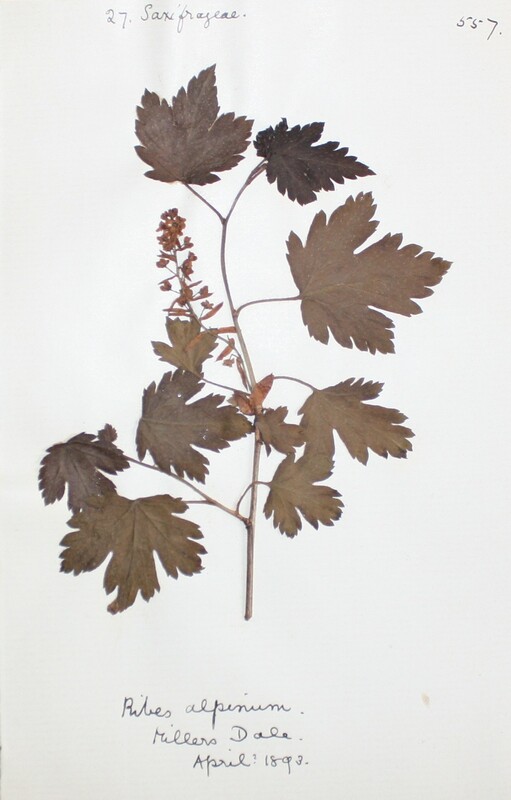 Almost half of the specimens are from the Peak District and the plants evoke, according to each locality, woodland shade, an intimate limestone dale, a wide slow-flowing river or panoramic moorland. Lousewort, Pedicularis sylvatica, Nr. Buxton, 1895. There are also 14 sheets of mosses, totalling 50 different species, although sadly its not clear where most of these were collected. 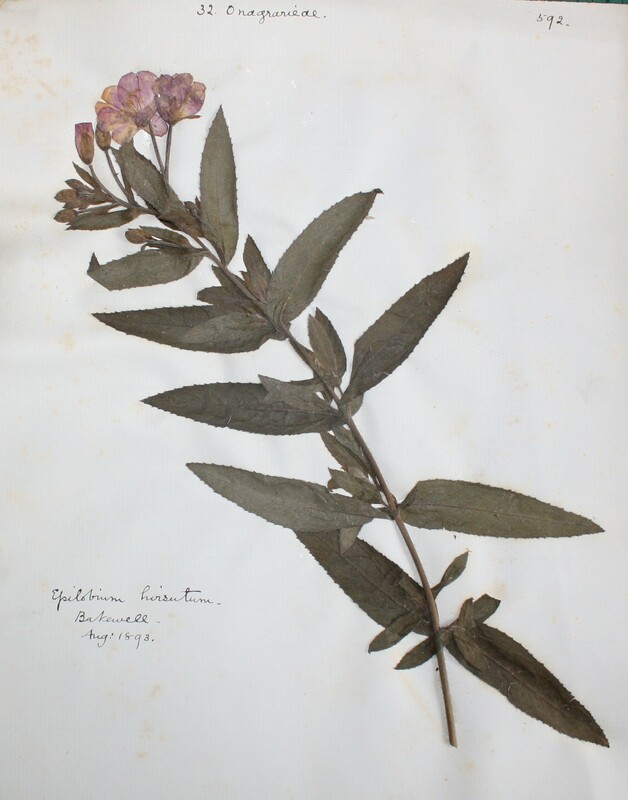 A handwritten note in the Herbarium says the specimens are ‘… named & numbered according to the London “Catalogue of British Plants” (7th edition) & placed in numerical order. E. Dale’. 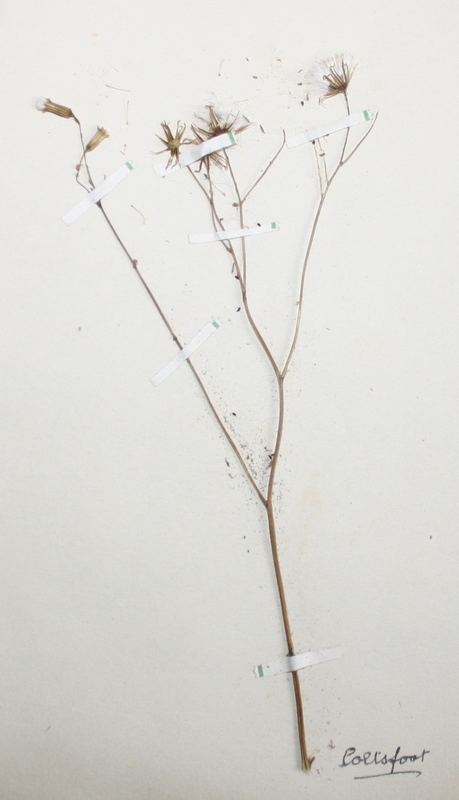 About 80% are labelled with data – plant family, species, date and locality. Most carry dates ranging from 1884 to 1908 and various methods were used to attach the plants to the paper. Felwort, Nr. Cat and Fiddle, Buxton, 1893. 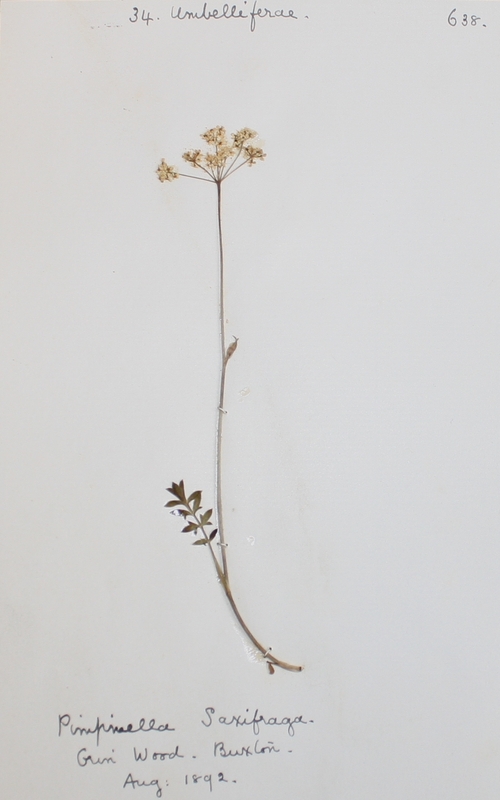 Burnet Saxifrage, Pimpinella saxifraga, Grin Wood, Buxton, 1892. … and some are held in place with glued tape. There’s less finesse to this one, which may be an early sheet, as it also has little data. I love the way the seeds seem to be blowing away! The sheets were stacked in a cardboard museum box. Typically for the late 19th century, any sheets that were exposed have a grimy layer from the fossil-fuel lighting and heating of the time. Those protected under other sheets (like the top one here) are much cleaner. They should clean up well with the use of a ‘smoke sponge’, which, used like an eraser, takes the dirt off without reapplying it on the next stroke. Not all have fared so well. Insects have enjoyed them too, apparently favouring the glue on some sheets! 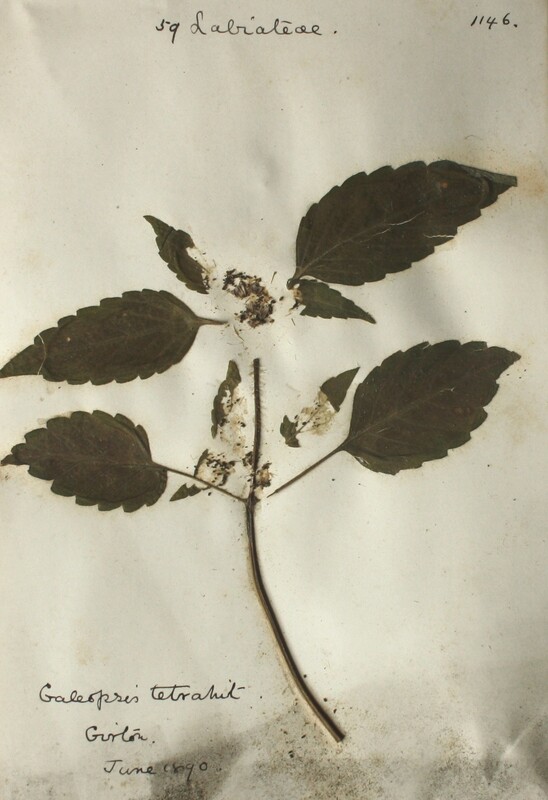 Common Hempnettle, Galeopsis tetrahit, Girton, 1890. Just in case there are any active pests, the Herbarium has been sealed in plastic and placed in a freezer to enjoy a chilly couple of weeks at -40°C. 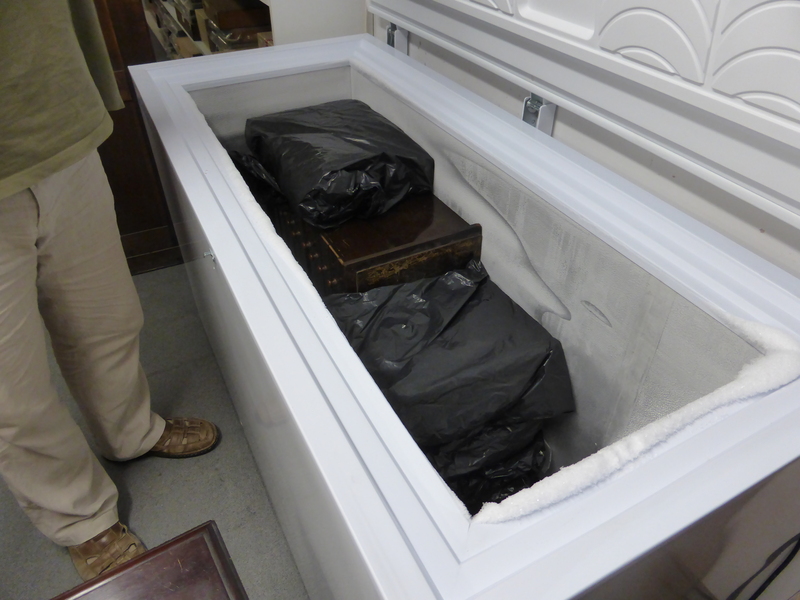 The Herbarium is placed in the freezer of Manchester Museum’s Entomology Department. 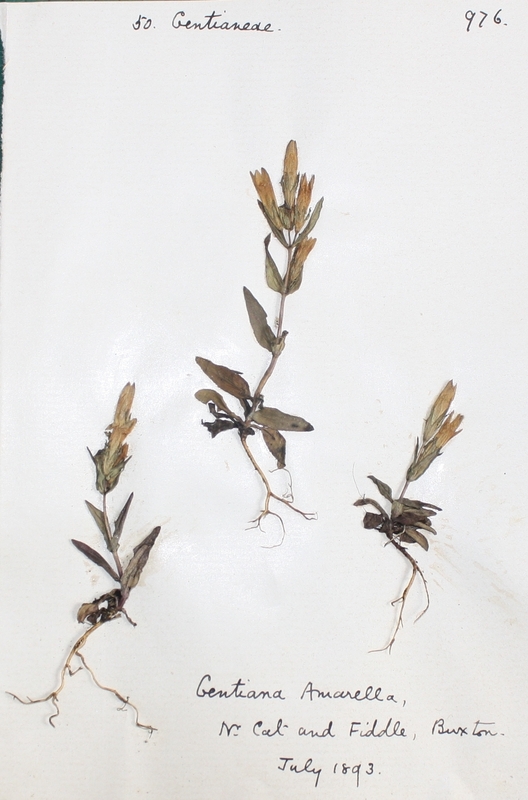 The plants were all collected by Elizabeth Dale. All the evidence from the handwritten note and the dates and localities of the specimens (and the systematic labelling) make her identity almost certain. She was born in Warrington in 1868, educated at home by a governess and then spent some time at a private school in Buxton1. 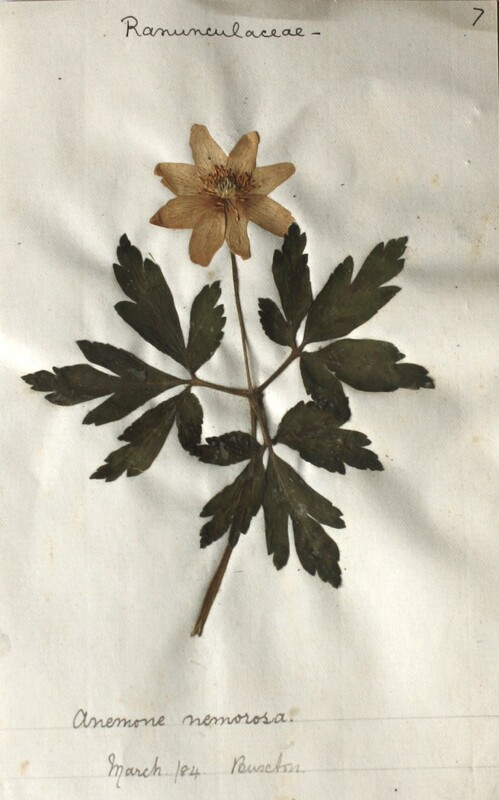 The beautiful Wood Anemone at the top of post would have been collected when she was 16 years old. She must have been quite an independent-minded girl. She studied for a time at Owens College, Manchester and then, from 1887 to 1891, studied Natural Sciences at Girton College, Cambridge. This was a time when women were still not awarded degrees or allowed to be university members, and at times were required to give way to men when laboratory space was limited3. 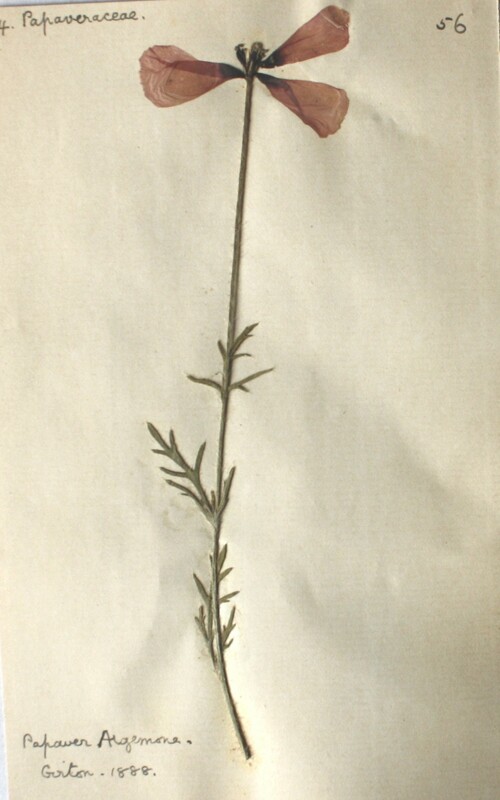 Prickly Poppy, Papaver argemone, Girton, 1888. She went on to be a research worker at the Cambridge Botanical Laboratory, working mainly in plant pathology, and published at least 12 scientific papers1. She also wrote The Scenery and Geology of the Peak District2 which I’m finding an excellent introductory read for the Collections in the Landscape project! 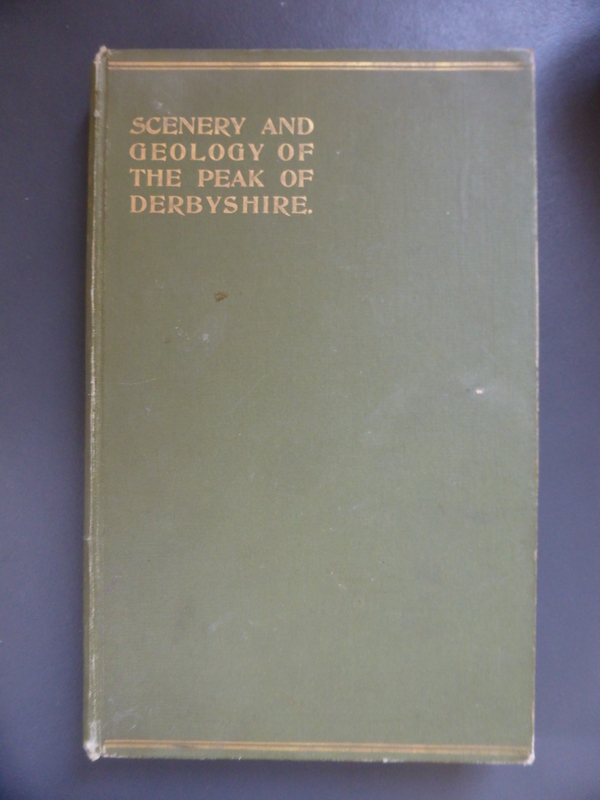 Elizabeth Dales book Scenery and Geology of the Peak of Derbyshire. Not all the plants are from Derbyshire – it looks as if she took the opportunity to collect wherever she travelled. (1) Creese, M.R.S. 1998. Ladies in the Laboratory. Scarecrow Press, Inc.
(3) Richmond, M.L. 1997. “A Lab of One’s Own”. Isis, 88: 422–455. (4) Watson, H.C. 1877. The London catalogue of British plants. London Botanical Exchange. London, Hardwicke & Brogue.